The number of public IP addresses that have been allocated to tenants. The number of public IP addresses that are still available for allocation. The percentage of public IP addresses that have been allocated in that location. The Public IP pools usage tile shows the number of public IP addresses consumed across public IP address pools. For each IP address, the tile shows usage for tenant IaaS VM instances, fabric infrastructure services, and public IP address resources that were explicitly created by tenants. The purpose of the tile is to give Azure Stack operators a sense of the number of public IP addresses used in this location. The number helps administrators determine whether they are running low on this resource. The Public IP addresses menu item under Tenant Resources lists only those public IP addresses that have been explicitly created by tenants. You can find the menu item on the Resource providers, Network pane. The number of Used public IP addresses on the Public IP pools usage tile is always different from (larger than) the number on the Public IP Addresses tile under Tenant Resources. 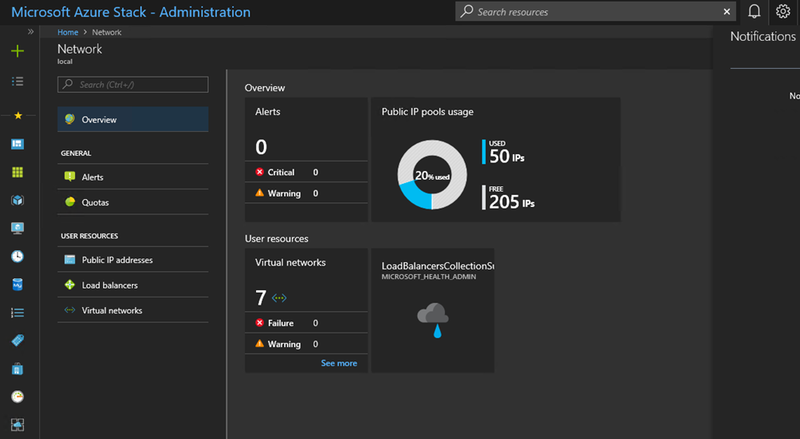 In the Azure Stack administrator portal, select All services. Then, under the ADMINISTRATION category select Network. The Network pane displays the Public IP pools usage tile in the Overview section. The Used number represents the number of assigned public IP addresses from public IP address pools. The Free number represents the number of public IP addresses from public IP address pools that have not been assigned and are still available. The % Used number represents the number of used or assigned addresses as a percentage of the total number of public IP addresses in public IP address pools in that location. Select Public IP addresses under Tenant Resources. Review the list of public IP addresses explicitly created by tenant subscriptions in a specific region. You might notice that some public IP addresses that have been dynamically allocated appear in the list. However, an address hasn't been associated with them yet. The address resource has been created in the Network Resource Provider, but not yet in the Network Controller. The Network Controller does not assign an address to the resource until it binds to an interface, a network interface card (NIC), a load balancer, or a virtual network gateway. When the public IP address binds to an interface, the Network Controller allocates an IP address. The address appears in the Address field. In different cases, public IP addresses are assigned that determine whether the address appears in one list or another.